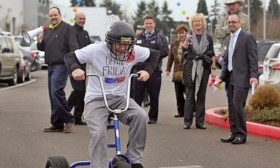 The trike race is an event during the mini employee triathlon to benefit the United Way. * Cool perk: Group meals. Employee lunches, which are often barbecues, are held at least monthly. On Wednesdays, customers and staff are treated to fresh, hot pancakes. * Charley Engelfried, relations director, on recruiting and retaining college graduates: "Capitol has sought out local schools that have programs particular to our industry. Linn-Benton Community College has an automotive technology career track. They even prepare students to pass the Automotive Service Excellence certification test. However, we know that students also need real work environments. We work closely with Linn-Benton to support their program through tours, job shadows, internships and through mentoring to help place their graduates. "We know college graduates can find the industry challenging whether it be sales, administration or technical work. We encourage continuing education and self-improvement as well as financial incentives to keep college graduates interested in continuing in the career. "We also know that exposure to the industry needs to start early. We have successfully partnered with our closest school, the Oregon School for the Deaf, to provide entry-level job training for students." * Engelfried on a change in response to staff requests: "Employee teams have requested more involvement in our United Way campaign. The lot attendants came to us with the idea of a mini employee triathlon, and they went forward with a fun run, a trike race and a boat trip on the pond on our property. Their enthusiasm and initiative added more to our teambuilding."